Antioxidant Chocolate -- Chocolate IS Good for You! Antioxidant chocolate may at first glance seem to be an oxymoron, but actually, chocolate and cocoa are both antioxidant rich foods supplying the heart-healthy benefits of antioxidants. Chocolate comes from the cacao bean. It has earned the nickname “food of the gods” primarily for its delicious taste. New research has shown that the “food of the gods” may also be one of the best antioxidant foods. According to Prevention magazine, a recent study found that people who are on a diet rich in cocoa and dark chocolate had lower levels of LDL (bad) cholesterol, but higher level of HDL (good) cholesterol. The same people also showed higher levels of antioxidants in their blood. According to a study published in the American Journal of Clinical Nutrition, eating 2.5 ounces of dark chocolate can lower your blood pressure and improve your blood flow. Another study, this time published by the Journal of Nutrition shows the heart healthy antioxidant flavanols contained in chocolate is good for your heart. Eating chocolate daily improves heart health. Chocolate is good for you and for your heart, but choose your chocolate carefully. 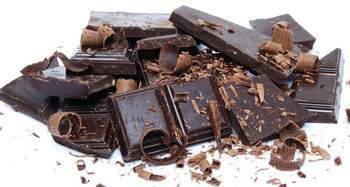 Dark chocolate has the highest levels of heart-healthy antioxidants followed by milk chocolate. As for white chocolate— forget it. This candy product is an impostor in the chocolate world. Eating well IS really delicious! To receive all of the benefits of antioxidants in your chocolates, look for a short ingredient list. Your chocolate should contain only a few ingredients. The most common ingredients are cacao (also called cocoa, cocoa beans, cacao mass, cocoa nibs, unsweetened chocolate, chocolate liqueur or cocoa butter) sugar, lecithin and vanilla. If there are any other types of fats added or anything artificial, you’re better off leaving it on the shelf. If you’re shopping for cocoa, the only thing on the ingredient list should be cocoa. “Dutch processed” cocoa has fewer antioxidants. Here is a source for raw cacao powder. Although chocolate is packed with heart healthy antioxidants, chocolate is not a blood pressure pill! Supplement your healthy diet and lifestyle with dark chocolate. Add chocolate to your other antioxidant rich foods, even on a daily basis. Remember that chocolate is high in calories, so enjoy it in moderation. To stretch the delicious chocolate flavor, melt the dark chocolate and use it as a dip for fresh or dried fruits to get more antioxidants benefits. For a different and smoky flavor— and some crunchy antioxidants— sprinkle some cocoa nibs into your next salad.